Traditional Solid Oak ledge/ ledge and brace Farmhouse doors add warmth and character to any interior whatever your project whether it be a modern development or an old cottage. 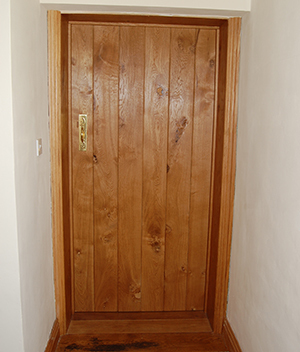 Doors are supplied sanded but unfinished for you to apply the finish of your choice. For advise on finish please call. Enhance the look of your door with ironmongery, solid oak latch blocks, architrave, skirting, Door linings. Please call for details.